Separately, Annie Dru and Amy Mayer have been gigging around the local acoustic scene for years, earning raves from San Diego music fans for their smart songwriting and gorgeous voices. 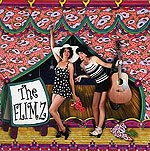 With absolutely no disrespect at all intended, however, nothing they did apart could possibly have prepared listeners for the positively stunning CD they've turned out together as The Flimz. Lush vocal harmonies and rich arrangements combine with some charming instrumentation and 10 great new songs to create a sound nestled somewhere between old British music hall and '60s hippie folk music. The sound (which seems to owe as much to Steve Forman's arrangements as Dru and Mayer's own considerable talents) on this record is warm and cozy and yet still fresh and new-sounding. The disarmingly winsome sound starts with the two women's voices: Dru and Mayer create a beguiling allure in their vocal harmonies. Forman then frames those vocals with a pump organ, a cello, a clarinet and an upright bass. That approach wouldn't work in too many settings. But given the richness of their vocal harmonizing and the caliber of songs that Dru and Mayer have brought to the recording, the kind of stripped-down arrangement needed to bring a clarinet or cello to the fore only highlights the detailed figure work they have embedded in their compositions. Dru wrote or co-wrote most of the songs here, and brings a smart, sassy, fun-with-a-wink attitude to both the construction and the lyrical wordplay. To illustrate with just one example, "Everybody Wonders" is a seemingly simple ditty built around a gently dancing melody, almost like a children's song. It opens with just a plucked acoustic guitar and Dru's voice; as the second verse starts, more instruments begin to chime in and Mayer adds a vocal harmony before a Beatles-esque bridge on cello leads to Mayer singing a counterpoint harmony behind Dru on the third verse. Suddenly, you have a song hypnotic in its immediacy, yet with so much going on that you find yourself hitting repeat on the CD player to go back and hear what you missed the first, the second, the third times through. And that kind of magic just isn't found very often.